I know I do not like Disney songs, but these are great. In the 1970s and 1980s these were between the ABC shows targeted at children. The creators assumed that no one really cared about them, but when their viewers grew up they learned their viewers actually often only watched the shows for the songs between them, and they were released to video where I saw them. Here is an iconic song about the government that is sometimes use in college to explain it. Besides that it has an easy to root for protagonist an audience surrogate. The congressmen are funny, and it is very catchy. For the most part this song is just really funny. Oddly they play this song in the VHS before the noun song, despite mentioning nouns many times here. Still it also has some really good visuals like them all getting on the bus. Sadly, I cannot honestly call this the ninth best song. 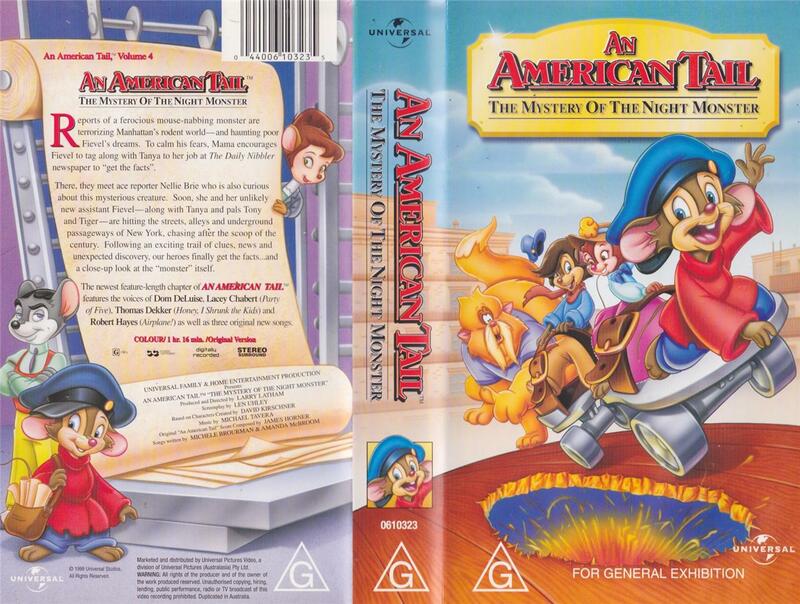 Unlike “I’m Just a Bill” this has a villain protagonist that we keep waiting to see the mouse have the last laugh, and it finally happens at the end when he escapes, after it looks like the segment is already over. He went through so much pain, and it shows a small victory can be all that is needed, while still helping me learn nines better. As a history major I have known since second grade there are some historical inaccuracies in here, but this song and realizing the inaccuracies helped me remember them. Besides that it has the revolution, but focused more on gathering the troops than fighting (more on that later), and why they decided to fight. This song is always great for a laugh with how many problems the protagonist has, and it is great. The visuals are good for both humor and what the world would be without gravity. Again the humor really makes this song. I know I have heard this analogy a few times, but this is the best discussion of zero as a super hero. It did not really teach me anything except for cavemen using math, but it has such great music, and super thin necks (look at him above). I do not think many other fans like this as much as I do. It has a very catchy chorus, and the verses tell a clear story that unlike “Victim of Gravity” has a clearly happy ending from the nervous system. I think this is the most educational video in Science Rock, even if it is dated. This is the funniest School House Rock song. It is one funny and unexpected visual and interjection after another. This one is about The Revolutionary War. Obviously it is exciting, and with the exception of parts of the Bunker Hill part is very accurate with a romanticized view for America. It will keep the audience remembering some major parts like France entering the war, Yorktown, Bunker Hill, The Old North Bridge, and crossing the Delaware. I do not think this is many other people’s favorite song. 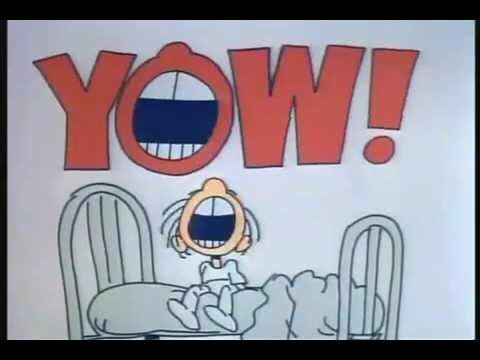 Money Rock is not too popular, but every Schoolhouse Rock fan has something in it they enjoy like “This for That,” or “Where the Money Goes.” This is the song that made me keep playing this video over and over as a nine year old trying to understand the national debt. It was not until I looked through some fifth grade textbooks I found another source talking about it, so I had previously assumed that being the world’s largest economy the US was debt free. Now I knew they had a debt of over five trillion dollars (now we wish it was that small). I watched it over and over to see if the ending was talking about it starting to shrink or just hope for the future. This is their most educational video and the scariest one. 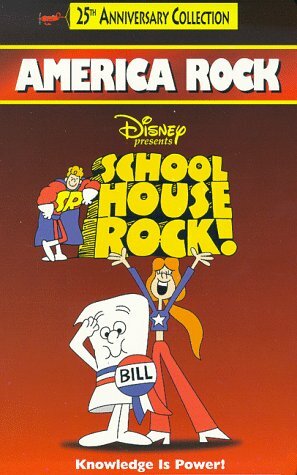 Schoolhouse Rock are some of the only music videos I enjoy, as they knew to entertain and then education could come. Besides nostalgia they are fun to watch and remember how much edutainment they had. This cover made me overestimate 625’s role. Oddly after I pan The Lion King II the next film ahs a trailer for the DVD release of the first one. This trailer made my brother want to play the safari game so much we bought it. We also lost it in the last few months. I always liked the Bionicle: Mask of Light commercial, but I never felt a need to see it. It makes me wonder what film has a commercial for its sequel. The commercial for the series has many spoilers for the film, which I somehow missed the first time I watched this around twelve years ago. The main menu has a part with Stitch swinging from a rope, which made me assume he would do that in the climax. Gantu is back to be one of the main villains. He still comes off as intimidating. I know several fans think he got way weaker after the original, but considering he is now much stronger than Jumba (Jumba fought Stitch far better than Gantu in the original) I have doubts about that. He is now working for Hamsterviel. Despite Gantu still being rather intimidating the overly small stuff and Hamsterviel’s voice keep this part surprisingly funny. The plan is for Gantu to go Earth (which the aliens no longer call Yars) and retrieve the other 625 evil experiments. The new animation did make the characters look uglier, but I only thought that for two minutes. 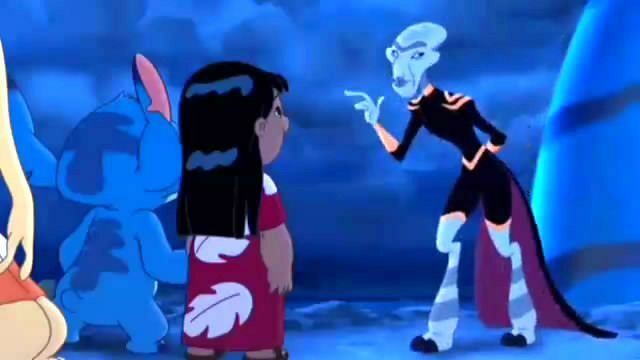 The main plot line is Lilo and Stitch want more people outside of their family to like Stitch. This leads to the main problem, there is very little story. In fact the run time is less than an hour, but there are still plenty of scenes that could have been cut easily. This easily could have been reduced to a 2 part episode. As expected it does not go well with Stitch scaring a few people away and that results in a little fire (Lilo was very happy to help put it out). Stitch goes to Jumba (his creator) to ask about family. Jumba says they both have no family. After a few jokes such as Pleakly cooking dog food, which is actually more nutritious than most human food and David getting his small role to keep his fans happy Gantu breaks in. This film has received a few idiot plot accusations. I disagree with most, but I always found it odd that Gantu beats Stitch early and does not use the opportunity to finish him off. It would have saved him a horde of misery the next three years, and it is later revealed that Hamsterveil would have plenty of use for him. Also Jumba just then tries to actually hide his other 625 monstrosities he thinks should not be activated instead of burying them a while back. 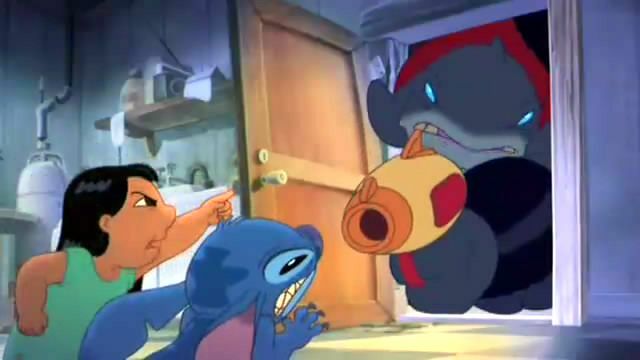 Also Gantu decides to just kidnap Jumba instead of looking harder. He des also find experiment pod 625, with its ominous music. When I was younger I only noticed the first one, and I thought it was very bad for the main heroes that Jumba is aliennapped. Stitch then hotwires Jumba’s ship, and they chase him into space. 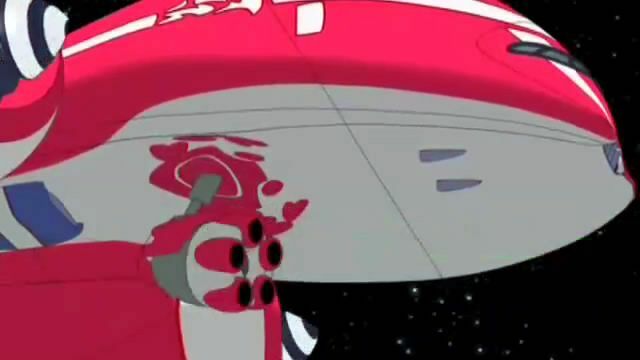 Stitch apparently has really good aim and manages to shoot the engines without actually hurting Jumba, but they run out of power. Presumably they have some emergency power that Stitch uses to make sure they fall at home and not in Antarctic or Venus. Wow, I am already throught one quarter of he film. I have criticized David’s role as being filler but most of his lines are funny such as him watching an alien invasion movie oblivious to Gantu having just assaulted his want to be girlfriend’s house. This leads to Nani calling Cobra for help. Lilo realizes that one of the experiments could repower the ship letting them chase after Gantu. Pleakly has the more long term plan of calling every phone in the galaxy. Lilo and Stitch release 221, but he wrecks the house’s power and leaves. They should have used insulators. They go looking for him, but it goes nowhere except some fun ideas for the characters like seeing Stitch’s night vision in action. It was not important, but the scene is fun to watch. No! Slam it! I think one of the idiot plots is how Pleakly tried to reach Jumba, which actually gave the villains an option for a ransom, and Lilo now regretting releasing Sparky since the ransom is now incomplete. I thought that was a nice change where plans work or fail. Sometimes a person realizes half way through their plan was bad and now has to change it. Stitch hotwires Cobra’s car, and they look for Sparky over a montage. I remember my dad laughing at the part where Stitch drinks an entire case of coffee. After that they find Sparky by following the screaming people and broken electronics. Stitch catchshim witht he rope swinging in the menu (I was surprised to see it so early) and a glass vase. They bond over some similarities, and they realize they are family. Pleakly and Cobra go to meet Hamsterveil and Gantu at the lighthouse. Cobra’s actions do fit into his plan later. He is hoping to give the experiments to Hamsterveil, get Jumba back, then the Galatic Federation will destroy Hamsterveil and the experiments. IT also has the good part where Lilo shows up and reveals she named 221 Sparky. The real good part is where Cobra claims she cannot see how complicated the situation is when she is like him taking a third option, save everyone by using Sparky as a distraction, which gives Stitch time to save Jumba. Despite that Hamsterveil gets the experiments, and Sparky takes out the Galatic Federation’s ship before it can destroy all 624 of them. Hamsterveil and Gantu with the experiments get back in the ship. Lilo and Stich ruin after them. This is less heroic on a rewatch since Lilo was useless from here onward except for a bit of keep away Stitch could have done by himself. They successfully get the experiments out of the window, and the case breaks letting them fall freely back to the island. It looks happy until Pleakly points out how dangerous they will be and the chairwoman agrees with Pleakly. to make it worse Lilo and Stitch are captured. I still do not know why Stitch cannot go through the glass, but I guess Gantu used better material. Hamsterveil threatens them from a huge pile of phone books. He plans to cut Stitch in half so he can clone him. Gantu is teleporting Lilo to a soup company. He then gets distracted as 625 is getting a huge order of baloney teleported to them. As everyone knew would happen Sparky comes in to save Stitch. They easily overpower Hamsterveil. Getting to Lilo is harder, as the musicand grunting make sit obvios the ship is hard to move through and the walls do not let Stitch climb them like he normally can. He gets here, but he cannot stop the teleportation. He then realizes it was for the baloney and frees Lilo from the other one. Gantu then chases them and sees someone is stealing his ship, but it is just 625 wondering where his baloney is. All he has is cheese and bread. It was actually a red herring and Sparky locks the doors and sends Gantu’s ship crashing on Earth. It also turns 625’s sandwich into a grilled cheese. They get back to earth. Hamsterveil is arrested. Sparky finds that he can do a lot of good at the lighthouse, which had no power before him. The councilwoman then says she will evacuate the planet and gas it to destroy the experiments. Lilo convinces her not to, as they will find them and turn them good. Now I feel the ending is a poor set up. When I was younger this made my whole family really want to watch the TV series, which is really good. Today I do not care for this so called film, but as the target audience I thought it was a great pilot. It is still funny, and it has good action. It lead to a very good TV series, and I do like the new characters. It is just too dull with the story for me now. The first sequel. It only has one preview of “The Adventures of Timmy the tooth.” It includes the villains capturing the sun with a rope. I think that sounds fun The Universal logo starts the film. It does not begin with a description of long ago. It shows meteorites in space (foreshadowing 3), and The Great Valley with music from the original playing. The narrator talks about “The Dreaded Sharpteeth” and shows Chomper’s dad. At the times he is ambiguously the sharptooth from the original and Frank Welker’s roar is very frightening. In the meantime the prequels have their first song. This is not confirmed, but I noticed all three songs are in the first half. It makes me think executive meddling forced this to be a musical and Smith wanted the songs done rather quickly. I think that is the same ledge they were on at the end of 5. It is a good song if you remember that they just got to the Great Valley after the first film, and it does a good job showing their parents being watchful, which foreshadows a key part of the film. Having survived the journey there the children view themselves as more impendent, but the adults still see them as children for a good reason. It also uses words like “sun” and “clouds” instead of bright circle and sky puffies. I really love how they o not use proper scientific terms by simplifying them to a basic English understanding. The next few parts is a natural extension of the theme that Littlefoot feels too small (like in 11 but done better by making him less whiny). It also shows The Great Valley is full of dangers further proving it is not Heaven. 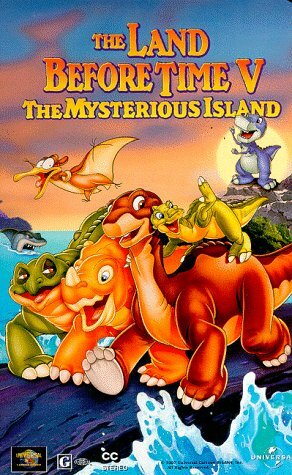 It has volcanoes, dangerous Geyser things, and hostile egg stealers ( presumably the one in the original that tried to get Littlefoot or the one sneaking in during the credits). With Jeff Bennet and Rob Paulsen voicing Spike and Petrie they are also several minor characters like Ozzy and Strut). They are after eggs. Like the ending to the original Cera calls Littelfoot to play, but they are bored, as they unknowingly stop Ozzy and strut from taking an egg. They eventually decide to play past the sinking sand. Thanks to Cera’s less than stellar jumping abilities they get stuck and are only saved by Grandpa. With this going on all of their parents are mad at them and not as trusting as earlier. Cera gets them to all leave at night. In the meantime Ozzy is starting to be present as drug addicted killer, while Stut is more level headed, but he hesitantly goes along. Ozzy’s love for eggs when they can just eat plants is like a drug addiction. I do not think too many fans consider his song “Eggs” good, but I think it is the best in the film. I like the puns and seeing him get so angry at is brother, and I always laugh at some point. Ozzy becomes the only dinosaur in the series to say his species name. 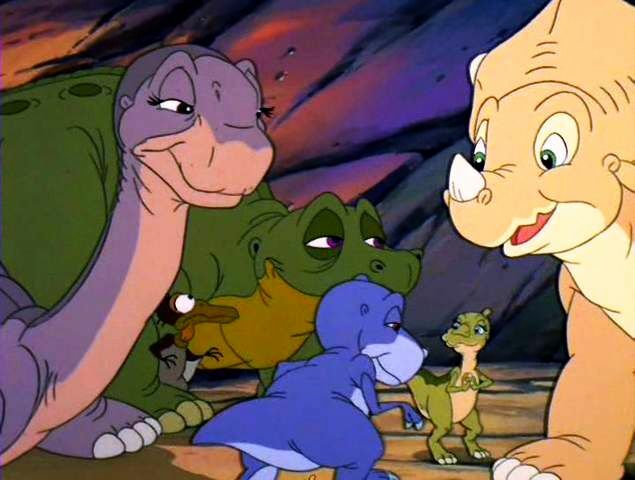 The main characters besides Littlefoot decide they do not need parents (I am pretty sure this film was a major part of me deciding the reverse). Littlefoot does not like their idea of running away to prove it. They eventually notice Ozzy and Strut taking an egg from Ducky’s family. Littlefoot wants to tell the grownups. Lead by Cera the others want to catch them to prove they are not hatchlings. Some fans are annoyed Cera is so much nicer ignoring she got nicer at the end of 1, and events change people. I really loved it how they resected us enough to keep character development. Cera reasons they have a 5-2 advantage (size wise I think they are outnumbered). They give chase and foreshadowing Chomper’s shadow Ozzy and strut only see the shadow and think they are huge. Eventually they hide in a cave. Now Cera is scared saying they should get help. Littlefoot has also switched saying doing that would this late would let them get away. Ducky and Spike are with him and Petrie tags along. Also like in the original Cera is scared of Thunder. In ensuing chaos They smash into a rock formation making a huge hole in The Great Wall separating The Great Valley from The Mysterious Beyond.” The egg never actually hits the rocks thanks to the egg stealers trying to safe it, and it rolls back to its nest. The main characters fall to a swamp filled with sharpteeth skeletons (like what the bullies walked through in 3). They find an egg that they assume is a grown up egg from earlier. They make a carrying nest to get it back, but find that the egg is already back. Littlefoot wants to tell the grown-ups, but Cera by threat o violence makes him not under the assumption they will be punished for leaving. I think she actually is mad at her daddy and wants to keep a secret from him. The egg stealers prepare to take it back until it hatches, and it is a sharptooth. The rest flee and run over the egg stealers knocking them unconscious. Littlefoot stays to raise it. He tries to teach him to walk, names him Chomper. He then realizes the food source is a problem. He refuses to eat plants. Some critics said the message about acceptance is broken due to the food issue. They are mistaking 2 with 5. The food part is never hidden at all, and that is why Littlefoot and Chomper cannot stay together. The message is really that parents know best and like his parents Littlefoot has to accept that he cannot take care of Chomper due to not being able to feed him like his real parents can. In a cute scene he asks his parents for information under the lie that he is just curious. They think it is just their grandson dreaming about being older, and play along. 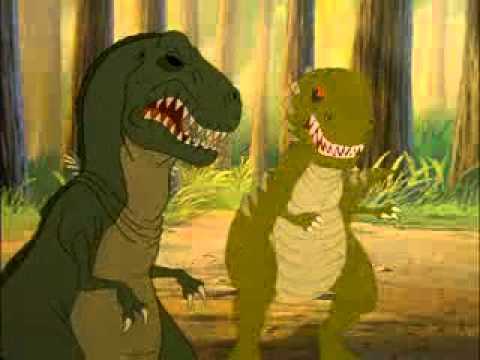 In the meantime Ducky, Spike, Petrie, and Cera think sharptooth ate Littlefoot and the egg stealers attack them. Littlefoot just realized Chomper did not obey him about staying in one place. He finds him, but then notices the egg stealers are about to throw the others off a cliff. He fails to save them, but Chomper’s shadow scares them into leaping to safety and great pain. Unlike the yellow bellies the animators did a great job at making these guys look fit. If this did not come out the same year as The Lion King I would think one of them was inspired by the other, as they both involve herbivores trying to raise a carnivore who eats bugs. Of course here it is used for drama, while in The Lion King it was used for comic relief. They sing the final song already “Family and One of us Now.” I never notably liked it, but it is perfectly fine. Chomper ends it with biting Cera on the tail turning all but Littlefoot against him. Ducky and Spike also turn against themselves realizing theyare acting like their parents to Chomper. Chomper runs off. For the first time until nine films later two sharpteeth enter The Great Valley. Ozzy and Strut climb their way back up (arm day today and leg day was yesterday I guess) they go for another nest, but the children’s screaming alerts mommy to save them. Ozzy is clearly mad while strut is slightly funny scared at the same time. Ozzy vows to kill them in retaliation. The gang saw Chomper at an active volcano. Time to completely ignore the poisonous gases. I am really wondering how the volcano did not affect the valley more than the drought next film. The egg stealers find the main characters and threaten to throw them I some boiling water. Strut laughs happily. I have mostly left out that Strut is slowly becoming more murderous like Ozzy. It is not really important to the main plot, but it does help keep the character interesting and show the audience what bad company gives. 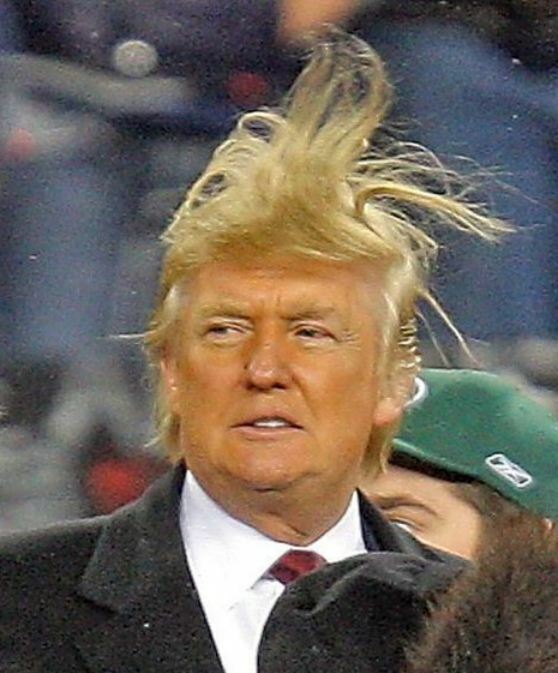 It started when he was mad the children took their egg. Cera claims they are friends with a huge sharptooth, but she slips and mocks them for being scared by a baby sharptooth. Chomper distracts them by biting Strut, but it is the volcano’s lava bombs that scare them away actually saving them. The lava is no where near as threatening as the fire and pales in comparison. Eventually there is a huge drop off on one side, a cliff on the other, egg stealers trying to kill them on another, and lava the way they came. Due to his growing protective instincts as he wants to protect someone he considers to be like a son, Chomper, he can now knock down a tree to make an escape path. Ozzy and Strut fall down and everything now looks good until the sharpteeth came. In a major way Ozzy and Strut are like Sue from 10. They could have been written out (harder for them than Sue), but they serve as red herrings making the actual big moment seem bigger. These sharptooth move faster and more normally than the one in the original and more like a cross between him and the Jurassic Park T-Rex. They also make a show of stomping on every tree they see. In a good move after one instead of finding The Great Valley it is now heavily threatened. After hiding Littlefoot reminds them and the audience that they caused it, and he wants to take responsibility by fixing it. Mama Sharptooth then successfully beats Grandpa in a fight but Petrie… Petrie’s mom colored wrong and then right distracts her long enough for Grandpa Longneck to get up and just leave. I guess he was telling the others where they were. They nearly fight but go back to get Petrie and Ducky until their parent arrive. I guess the stegosaurus and Ducky’s mom stays in the rear, as Grandpa and Grandma take out Mama Sharptooth and Mr. Threehorn beats Papa Sharptooth. They then flee, the children come out of hiding, and “If We Hold on Together” plays making it better by default. Chomper quickly follows the other sharpteeth. Cera spills the beans about the hole and the grown-ups go to close it. Littlefoot chases after Chomper and finds him, but so do the sharpteeth. Littlefoot gets stuck and thinks he and Chomper are done for until the sharpteeth kindly lick him and put them on their head. Littlefoot lets them leave until he is captured by the egg stealers, and it is Strut who suggests throwing him off the Great Wall (this is the only film to use those three words). Making Strut get more villainous kept these two surprising, threatening, and interesting. Chomper hears and leads his parents back to the egg stealers, and they save the day. Technically the chase last until 4. In a rather emotional moment Chomper is torn about who to stay with, but Littlefoot insists he go with his real parents who can take care of him. He leaves and the others arrive in time to tell him goodbye, which is important for Chomper’s ending if he did not show up again. This is bittersweet enough to leave a sequel, which could even surpass it. In the closing actions it is confirmed that the main characters are on good terms with their parents again due to accepting their dependence on them, and a reprise of “Peaceful Valley” is played, and it is actually better than the full version. The villains are very good. The moral is very good. The action is fine, but the beginning and not so amazing songs hold it back from the best sequels. Then in the credits one key animator is named “Thomas Decker” giving him a very similar name to an actor later in the franchise. For the first time the new film has no songs to be added to the top 15 song list. “Eggs” is the best, but it is not as good as “who Needs you.” Of course this list was put together rather hastily, and most years it would be different especially after the first 4. The new film rankings are 5, 7, 3, 2, 6, 10, 8, 14, 4, 12, 11, 9, 13. It depends on the year about whether 3, 5, and 7 are ordered, but they are the top 3 sequels. The odd numbered films in the second half are notably the worst of the series. It depends on the year about how I rank the even numbered films, but 6 and 4 heavily change each time. I decided two is the best of them due to being a major part of the series and direct-to-video. It is nowhere near as good as 3, but it is very enjoyable. My favorite eras in order are theme (5-7), Roy Allen Smith (2-4), Full CG (8-10), and Later (11-13). Many older fans do call this the best of the sequels, as it has very scary moments, intensity, high stakes, and a surprisingly complex theme for the title. The theme is that anger leads to more anger from others, and that stops teamwork from being effective. The Previews here are very good. I like the commercial to the second film, and it does make me want to watch it again. Then it gives a commercial where they sing “All Sorts” from 4, with clips from the film instead of most the song clips, and I like that better than the actual song clips. I remember saying Babe has a commercial for this film. well it has a commercial for Babe too. It is very good and fast paced. The “Timmy the Tooth” commercials are better in 2. Of all the sequels this has the best opening. It uses the same music from the original film. It talks a lot about evolution and how single celled organism became land dwellers, yet I it is actually because of these openings I became a Young Earth creationist. I got exposed to so much evolution I turned against it. I still like seeing the animations of it. They even got the narrator to say “dinosaurs.” I also like how it briefly shows feathered raptors and then they take out a three horned like dinosaur. Like 2 it role calls the entire group. Littlefoot the longneck. They are no longer extinct. Cera the Threehorn (who has one horn for now). Ducky the swimmer (who is hardly ever shown swimming), Petrie the Flyer (Still love him), and Spike the Spiketail (a little redundant). They are using a huge rock as a ball until Hyp and… Nod and Mutt. Unlike Rinkus and Sierra they blend together. I know the bullies are often hated by older viewers, but these three are great, as they actually come off as murderous. Just considering how soon this is from the original it makes sense. The group is yet to save anyone living in the Valley so no one owes them anything. The bullies are teenagers who probably dislike that some children have had a far more adventurous life than them. 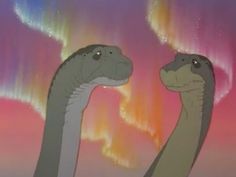 In their opening talk Littlefoot views them as potential playmates. Petrie views them as bullies and dislikes them. 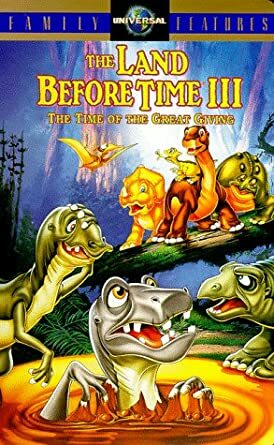 Ducky and Spike agree with Littlefoot Cera not only agrees with Petrie but tries to fight them, which makes Hyp excited until a meteor shower comes including a big one into The Mysterious Beyond. Then the water source stops flowing. I mentioned in my review of 6 that there are other water sources. Since they have not been in The Great Valley for long I guess they have not found them yet. Grandma and Grandpa do not want Littlefoot to hear the others fight and ask him to go play somewhere else. He does that as we can hear the grown-ups fighting. 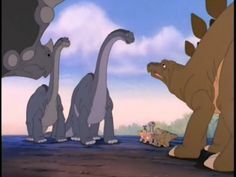 Littlefoot meets with the other children where to further Show spike’s hidden intelligence he hides before the bullies show up. The song are again written by Michele Brourman and Amanda McBroom, as the first one “When You’re Big” is sung. 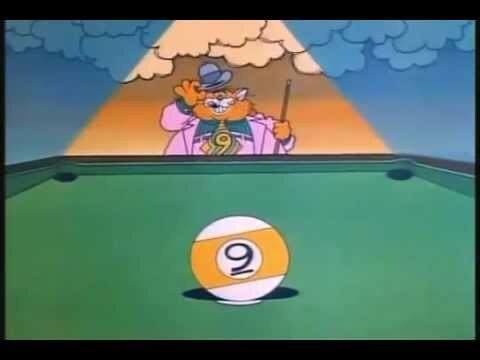 Unlike Charles Grosvenor who used one film with sentient villains in eight films Roy Allen smith used three in thee films, and they all have villain songs. I know this sounds like the song I usually hate being a villain song and just talk about being evil, but I love it. It captures the destructive energy teenagers and their pure threat level. It is also so catchy. I have seen some good fan videos of it with Jurassic Park dinosaurs. After the song Hyp tells Nod and Mutt how they will presumably kill the group for fun, as they sneak out. They miss Spike who just hid. After that Grandpa’s water conservation plan is basically to trust everyone to do their part. Being the small government supporter I am I am okay with the idea, but it needs work. I presume everyone else just interrupted him before he could finish. Mr. Threehorn suggests firm action against wasting, and he unintendedly starts many others going on a crusade on who has previously wasted the least water. Another lesson in the film is cooperation is needed to survive the hard times, and the grown-ups do not have it, and the immediate negative effects of the film start. At the same time the bullies splash some water and Mr. Threehorn accuses Littlefoot (presumably thirst and hunger is making him less sane). He deems Littlefoot a bad influence, which makes Ducky wonder what influence is, which is surprisingly funny. He also demands that Cera stay away from Littlefoot and she angrily goes with him until night when she runs off. It is then shown that Mr. Threehorn is overly worried about his daughter, which makes him angrier than usual, which Cera can tell. In a key moment showing that Grandpa does know best they educate Littlefoot and most the audience on morning dew. They get an okay meal, but the food is dying out fast, as the valley dries up. It is also revealed that off screen they made a time schedule for each herd, but Grandpa says it does not affect the Children, and Mr. Threehorn disagrees. It is surprisingly hard to follow the logic that Mr. Threehorn’s problem is he refuses to compromise, but he gets a song. “Standing Tough” is surprisingly enjoyable. It furthers his motivations that they will die without him doing it and any compromise is weakness. They are too busy fighting to notice Littlefoot leave with Cera. To further the depression of losing water there a few quick silent scenes showing how the water level is clearly way lower, the fish are struggling, and there is far more dust than usual. The group finds water (I like to think it is the same pond that dried up in 6), but the bullies show up. In a move that really sets them apart instead of trying to take credit for finding water they give the gang a decision, never tell anyone about it and let the bullies only use it or die. In short their plan is to have water and let everyone else likely die. Instead of lying that they will not tell and then tell (no one would fault you) they say they will not and flee. They are saved by a wasp chasing away the bullies. I really like that. The group goes a strange route reasoning their larger pursuers could not cross where they see the desert part of The Mysterious Beyond, but it is covered in the water that would go to The Great Valley, as flying rocks dammed it up. They go to tell the grown-ups sure they will know what to do, but as Grandma warned earlier a fire starts. Unlike the fire in Bambi that uses an orange fire that engulfs the forest, this fire is mostly smoke blotting out the vision except for a very red fire burning every tree and piece of vegetation near it. This fire is quite scary. Michael Tavera is alternating music from 2, and it is actually working better here than in its original use. Presumably due to their bickering the grown-ups missed the smoke. It also would have obviously been seen by The Great Valley residents not near the water. Mr. Threehorn takes command and gives an escape route, but Grandpa points out it is heading downwind where the fire will spread and he gives an alternate route. Instead of listening to superior advice and noticing he is wrong (When you should devote to the one group ironically) he is fine with them going another way, but he orders Cera to go with him. Grandpa goes to stop them, while Grandma leads the others to safety. The smoke gets to thick so Littlefoot (closer to the ground) has to take charge and tells everyone to use their voice instead of ears. It is the first time he saved the valley instead of just an individual or his friends. The music then gets even more scary, as it shows Mr. Threehorn and Cera running. It is slow and constantly makes it clear how much of the valley the fire is destroying. It is also clear that Mr. Threehorn is watching for Cera more than himself, but they eventually get trapped. Grandpa saves them by knocking a tree on the fire, and they run out before it is engulfed in flames. They arrive as “If We Hold on Together” plays. Everyone but Mr. Threehorn is at first optimistic, but his pessimism runs into everyone. Grandma gets Mr. Threehorn happy by mentioning his daughter being safe, but most others are convinced they are doomed ( a good trailer shot). They know the water would have to be covered in sharpteeth. Mr. Threehorn says no place is safe unless they free it. Mr. Clubtail (voiced by Rob Paulsen again) points out his plans could not be worse than his fire escape plan resulting in them roaring at each other. Grandma says they are acting like children and finally a movie has a kid defend themselves when that happens. Thank you Petrie. We can hear the adults fighting as Mr. Threehorn wants a quick plan and Grandpa wants a well thought out plan. The bullies decide to get it themselves. The main group notices and besides Littlefoot they are rooting for the sharpteeth. One reason I love “When You’re Big” is because it is deconstructed in another song, “Kids Like Us.” I should point out at some point. Thomas Decker voiced Littlefoot for 13 songs, while other Littlefoot voice actors voiced him for only 15 songs over nine films, and this is the only time Littlefoot sings in this film. It perfectly contradicts every point made in Hyp’s song. I love it. After that they go to help Littlefoot with the last one being “a scaredy egg.” My brother and I used that insult so many times. This is the first time I ever saw velociraptors, and four of them show up. I love the shot where one’s foot goes down, and his claw comes up. There are four of them. One lunges at Grandpa, but he uses his tail instead of his head (like in 10) as bait. He then hits him to Mr. Threehorn. A rock falls on his head, and we never see him again. Based on what his friends do I presume he was the weak scout they sent in. Hyp’s dad takes the children to safety, and the rest face the others 4-3. Well Littlefoot looks back and sees Grandpa is double teamed, and almost stops to help. It does contrast form earlier how nicely Hyp’s dad tells him not to look back. Despite most likely triple teaming the other one they cannot beat it I presume because they must have put Nod’s dad on him. The grown-ups make the wall defense, which is horrible in real life because they attack the weakest link, but in movies it often works, but not here, as they just run around or even over Nod’s dad. He should have stayed home today. The children and Hyp’s dad see them from the high ground in front, but the grown-ups have a growl off with them, and we hear shaking as if there battle is making an earth quake. Then all seven of them fall. The grown-ups are out, but somehow all three sharpteeth shake it off. What steroids are they taking? Hyp’s dad runs off to the rescue in a scene that would be horrible if the pacing was not so good making it awesome. It goes from slow paced to so fast. I presume the sharpteeth are still shaken up from the fall and too bruised to move fast, and their steroids affect their brains. Nod and Mutt mock him, but Hyp goes down to distract them, but all three go after him. The sharpteeth chase Hyp, but Grandpa takes them all out in one hit (I am pretty sure that should kill them all). The sharpteeth flee to the rocks to get the children, but Mr. Threehorn takes out another one who gets buried in rocks. I know I often criticize the show for throwing rocks at them too much… Actually I only did that in 13 and 10. Well it really starts right now, but the music and theme coming together about working together, and Hyp’s humor make this rock throwing work so well. Unfortunately all three sharpteeth catch second wind again (I also have to question why Grandpa used his head as bait with no counter attack as usual). It then turns out all the rocks they knocked around has freed the water. The grown-ups flee to the high ground, while the velociraptors are swept away. A later scene shows all three on shore seemingly kissing it. That was awesome. Surprisingly the falling action is very long, and kind of boring, an it includes a title drop. Only 3, 7, and 12 have title drops and this was the only one that was forced. Overall this has a great use of silence and pacing. The songs go together so well. The theme is remarkably adult and child centered. The climax is amazing. It took clichés that children were not yet well aware of, and it did great with them. As the target audience this was my second favorite of the series after only 5. The new film rankings are 5, 7, 3, 6, 10, 8, 14, 4, 12, 11, 9, 13. 3 was a heavy contender for the title of top film, but I enjoy 5 too much as a kid and 7 too much as an older viewer. It 3, 5, and 7 are the top 3 and very close, and they are the notable big three. DTV Wonders: The Land Before Time IV Journey Through the Mists. The last film of The Roy Allen Smith Era, and the last one to be directed by him. It is written by Dev Ross. Besides The Wisdom of Friends (13) it is the only one without Littlefoot on the mid cover, which has Cera’s tail. That was always odd to see. Also Warren Taylor instead of Jay Bixsen is the editor. Icky has a pair of binoculars on the front cover above, which foreshadows his song. Most critics hated this, but the target audience loved it. The commercial to Flipper brings back memories, as my sister loved it, but it feels nothing like the film. I cannot say the commercial to this film, which is next, is good. The “We Sing Dom” commercial is also poor. The most interesting part of the trailer is they put the Universal Cartoon Studios logo before instead of after the film. Unlike the others it right away reveals the title. Based off this and the poor animation I think it was made really quickly. The opening does have some good foreshadowing when a whale opens his mouth to resemble a crocodile. It is also impressive when he jumps out of the water. 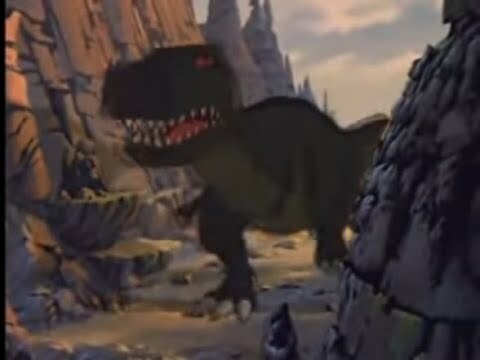 We also get to see some egg stealers (presumably Ozzy and Strut) included) running from a sharptooth resembling Chomper’s dad (a popular misconception is there is no land sharptooth this film. Only 9 as that distinction). I guess they ran back to the herd, so they would only have to outrun their slowest herd mate. Back in The Great Valley Cera knocks food off a tree and laughs by saying “Hee.” I know that with Candace Hutson as her actress she did that a few times, but she does it five times in this film. I surprisingly found it to be a cute laugh that sounded like it came from a kid. Littlefoot chases a Drangonfly and sees a herd of Longnecks coming in. He and his grandparents go to greet them, but Grandpa has trouble getting there. The grown-ups meet the herd. Mr. Threhorn is really quiet after getting nearly the entire valley killed last movie. Besides 13 this is the only one where he never talks. The longnecks are lead by “Old One.” She is called wise, which Littlefoot doubts. She uses fear tactics to get others to join her migratory herd. When she asks about The Great Valley they say it is the same as usual. I guess a fire, drought, and famine in the last movie is normal. Further proof this is not Heaven. She then starts with the fear tactics by going on about how everywhere is changing for the worst and only Longneck safety in numbers can survive. I would consider safety to be who can eat all the food before anyone else and ignore them, but it is convincing Grandma and Grandpa. I do like how a few longnecks next film look like her herd implying a few got smart and stayed in The Great Valley. 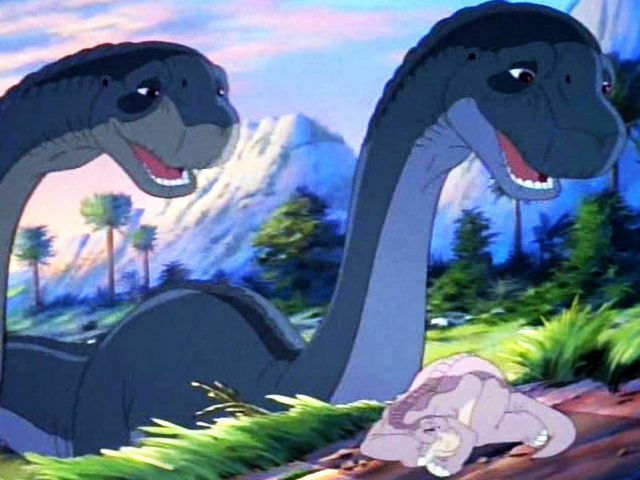 Littlefoot and his friends play catch Cera where he meets Allie (no romantic interest, but it makes me wonder if the producers actually shipped Littlefoot and Cera like a few fans do). Allie likes Littlefoot and is scared of the others due to them being different. It is a good call back to the first one, and it fits the moral that all types of people are needed. Littlefoot decides to play with Allie instead of his older friends due to her funny faces. None are actually funny, so I presume he really just wants to make The Valley’s guests happy. Seeing that makes Cera declare Littlefoot to no longer be there friend. In a good move the others vocally disagree, and it is obvious Cera does not mean it. Grandpa gets deathly sick. The only way to potentially save him is to for him to eat the nightflowers, which are where the migrators (not called “far-walkers” or “wanderers”for some reason) are from. Grandma gasps for the second time this film, and is discouraged when no one will help her get it. Littlefoot is determined to get it. Grandpa makes him promise to leave with the migrators with Grandma if he dies, which I find to be faulty logic, but The Old One really got into his head with her fear tactics. I am really glad she has a small role. Grandma sing the first song of the film and her only singing role in the franchise, “Grandma’s Lullaby. Leslie Bricusse wrote the songs instead of Amanda McBroom and Michele Brourman like all the others so far , and she did very well. The song says the words “circle of Life” which got one of the worst internet fandoms angry, The Lion King internet fans. They are overly paranoid everything is ripping them off. Here is why it is not a rip-off that anyone should be able to see right away. The Circle of Life was also mentioned in the first film, which came out six years before The Lion King, which turns the argument around using their overly simple logic. Now it means The Lion King ripped off The Land Before Time, and there are plenty of other similarities before them. This film is doing what sequels are supposed to do and remind the viewers of the original. Some further proof the are not hoping to simply cash in on its success is the second film came out the same year as The Lion King. It also mentioned the circle of life. Both arguments still fall apart due to a major detail, both have entirely different definitions. The Lion King uses a definition that connects all life to a food chain. 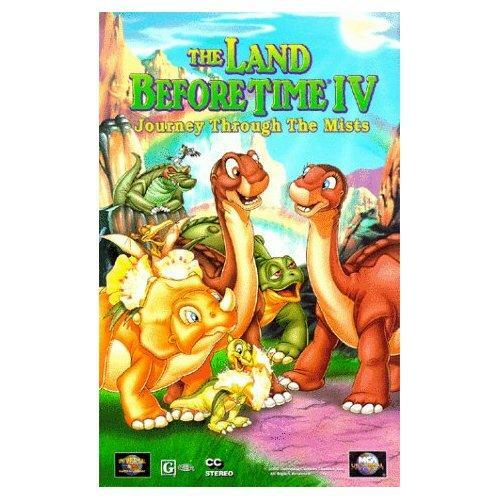 The Land Before Time and its sequels have a different definition. It uses a circle to connect all parts of life and we all have to die at one point. The final point is that “The Circle of Life” is not original to either film by a longshot. The song itself has some very nice visuals, and it does not shy away from the darkness it implies. I really like it. Littlefoot sneaks off to find the night flower. He first enlists Allie since she knows the way, but she convinces him it will be faster to bring no one else. I am starting to think Cera has a point. Grandma is not happy. 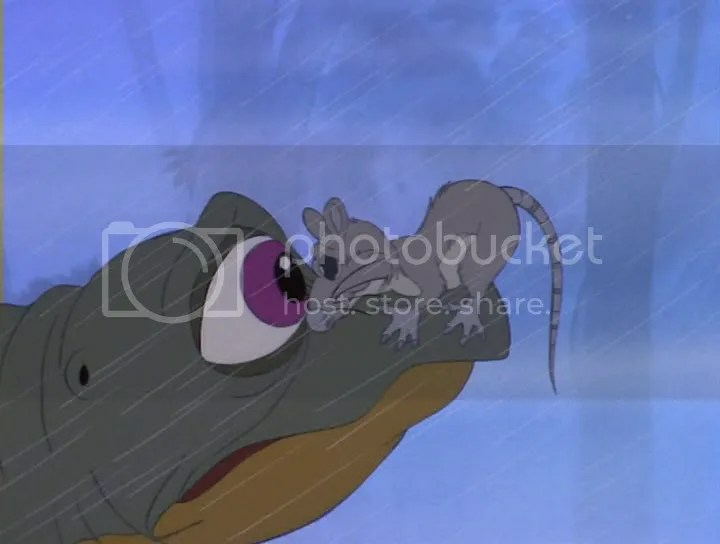 Ducky volunteers to go get Littlefoot, but Grandma makes them promise not to presumably knowing it is all she can do to keep them in the valley. There is actually an important landmark coming up when they leave. This is the first time since the original a majority of the film takes place in The Mysterious Beyond. Allie and Littlefoot arrive at he best part of the film, the cave. An earthquake (another callback) sepearates them. Allie leaves to get help being on the right side for that. Littlfoot meats a turtle who looks very similar to the ones he saw in 9 and in the opening to the original. I love that part. The turtle is named Archie, and he helps Littlefoot despite pulling a muscle. Allie gets the others, as they agree after Spike decides to help her (good job Spike), but Cera stays back not trusting Allie. It is obvious she will come later. We are then introduced to the villains, who had a few quick glimpses earlier. A crocodile named Dill and a sharp Beak named Icky. I expected to heavily criticize them, but in the cave Icky is plenty intimidating and they are actually really funny. They even argue like an old married couple wile singing “Who Needs you.” As a 13 year old I thought this song was hilarious. My sisters still love it. I still like it. One real problem though is a giant prehistoric crocodile is not as cool as a theropod. They eventually find Littlefoot and Archie and chase them down. With the rest only Spike is getting any rocks moved until Cera shows up and literally destroys rocks and one falls on Dill’s head knocking him out and taking out Icky too. Allie is the least useful. The rock scene in 3 is really paying off. Archie knows the way out and shows it as “If We Hold on Together” Plays. It is very fitting for Archie’s speech about staying together. I know I glanced over the cave scene rather quickly to save time, but it is a very good highlight, and I love it. It is a fine scene except forgetting about Cera. They then find Cera making everything look good again. She gives another “Hee,” but she falls into the river due to the rocks falling. Ducky throws her a vine. Oddly Cera sees Dill and Icky coming to get her and does not swim to the rocks to climb up. Icky instead of feasting on egg stealers cuts the vine. They go to eat Cera instead of the horde of egg stealers due to their bad breath I guess. Here is when Dill’s lack of threat hurts the film. Dill gets stuck in a tree leaving the less threatening villain around. Allie goes down to save Cera, which works and they finally like each other as “If We Hold on Together” plays. It also contrasts the villains arguing. Our final song “All Sorts” is the basic moral, and not much else. It does give the villains another purpose, as they are too busy fighting over each others’ strengths and weaknesses instead of using them to help. It does have a nice touch when Cera sings with Allie and Littlefoot even though Candace Hutson’s singing voice is not as good as Andi McCaffee’ singing voice. Look to the left side of the picture and similar to Icky’s binoculars there is a microphone on a pole near them. I think I know why I like Dill and Icky. I am so used to them being portrayed as terrifying villains it is nice to see them being the main source of comedy. The rest of the group finds the nightflower, but Dill and Icky literally just bump into them. Icky captures Petrie, but Tickles gets him to bite Dill’s tail instead. This turns Dill on Icky until they hear Cera say “Hee.” Realizing where they are they follow them over a bridge where Ducky goes to retrieve a flower by half grabbing, pulling back, and then fully grabbing. Icky captures Ducky. Petrie finally makes himself useful by trying to safe her and nearly choking her. 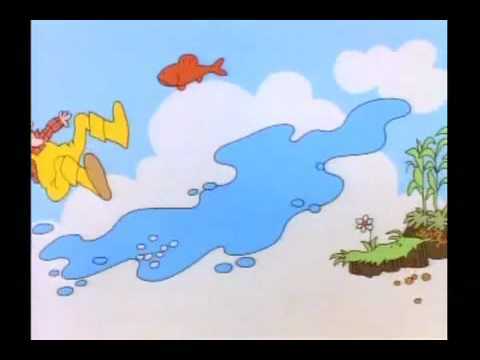 Ducky falls unconscious, and she is about to be eaten by Dill (how did she get down there and why not get the others). She is woken up by Spike talking. I actually remember the first time hearing this despite the film coming out the year I was born. I always thought it was a logical progression that he would talk eventually, and that is a very memorable part. It wakes Ducky up and with Petrie and Spike’s help Dill instead grabs Icky with her mouth. When she lets Icky out they finally leave. They say goodbye to Tickles. They wonder if they will all meet again someday. Based on what the Evolutionist narrator says Tickles descendants will kill yours so no. The rest get back and save Grandpa. He is good, Cera gives one final “Hee.” Five total this film. The narrator says Allie will return not mentioning it is for a sucky episode of the TV Series. When I was the target audience I never really cared about this one. As an adult it depends on the year, but I always love Archie. It has good foreshadowing songs, and humor, but it struggles in animation and mood. Like 6 it depends on the year how much I enjoy it. The best songs are now 1. Very Important Creature (7) 2. Beyond the Mysterious Beyond (7) 3. Bestest friends (10) 4. Always There (5) 5. Grandma’s Lullaby (4) 6. Big Water (5) 7. “The Lesson (8) 8. “Family (8) 9. Adventuring (10). 10. flip, Flap, Fly (12). 11. How do You Know (13). 12. “On You’re Own” (6) 13. Who Needs you (4) 14. Chanson D’ Ennui (9). The new film rankings are 5, 7, 6, 10, 8, 14, 4, 12, 11, 9, 13. Many people wonder how this series had so many fans. The answer besides it being good is it was an alternative to Disney. For those of us who did not like Disney we could still get our animation from Universal Animation Studios. The first commercial is a very good one for the series. It mostly uses segments from 5, but they are scattered throughout the first five films. Next is a commercial to Hercules and Xena: The Animated Movie. It is a horrible film, but the trailer is awesome. I am okay with the Chipmunks Adventure commercial. There are plenty of changes for the series starting with this film. The box does not say MCA Universal, but the logo in the opening does. This is the first film of The Theme Era, first film directed by Charles Grosvenor, last one with Andrea Romano as the casting director, the first film written by John Loy solely (out of seven). The first one with Andi McCaffee as Cera’s actress, and the first without Candace Hutson voicing her. Aria Noelle Curzon replaces Heather Hogan as Ducky. Miriam Flynn replaces Linda Gary as Grandma Longneck. all of these actor changes are still around. I guess they wanted to keep Romano active until they replaced everyone. Scott McCaffee, Andi’s younger brother, was replaced by Brandon La Croix as Littlefoot’s voice (Wikipedia says his last name is one word, but the credits made it two words). Thomas Dekker would voice Littlefoot for the next four films, and he is the singing voice. 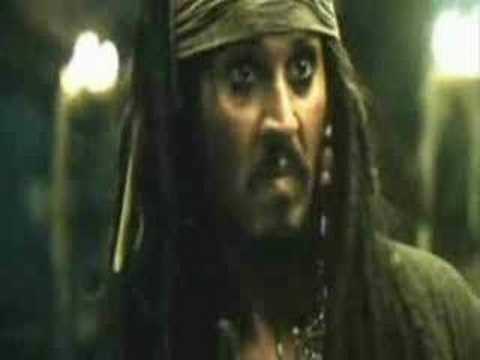 The Universal logo does not make its usual music, but the opening music for the beginning of the film. The narration has what appears to be a galaxy forming. It is a dark opening with two herbivores fighting for food until Chomper’s mom eats them. It opens with the main five characters first playfully fighting over the last tree star in their favorite tree, until it gets more serious. I do not know why they should fight with everything else they managed through. It includes a chase scene when it blows away, with very bad word to lip synchronization from Petrie. Mr. Clubtail who is voiced by Jeff Bennet instead of Rob Paulsen in The Later Day Sequels gets it. I really should add this. When I was younger this was my absolute favorite movie. I have seen this at least fifty times, and can quote most of the dialogue. As the usual voice of wisdom Grandpa gets them to forget it based on that The Great Valley has so much food. That is until a plague of locusts (“Swarming leaf globbers”) comes. The opening before had an overly long foreshadowing, and was poor, but this is great to see. It helps completely end the believe that The Great Valley is Heaven (which is not supported in the original), and it is quite scary to see it come to ruin. The Series is at its best with high stakes like 8 and 7 have. This increases it by putting the whole herd’s life at stake like 8 did but also intense conflict between them. With The Great Valley only having water the grown-ups meet in the same place as 3, and Grandpa points out the obvious. They actually only listen when Mr. Threehorn agrees, as them agreeing is a real shocker. Grandpa says they must leave, which shocks the others except Mr. Threehorn. He says all of them are from The Mysterious Beyond originally. The main characters fear they are dividing into herds, but the grown-ups decide to stay in one big herd (It was revealed in 7 that is how they arrived, but the young ones do not know that). The new actors are currently doing perfectly fine. Hutson was not a good singer, but McCaffee is. La Croix is not great, but he is doing perfectly fine. Dekker does a great job at impersonating him as a singer. Ducky and Cera’s new actresses give new youth to the voices. For the only time in the sequels the narrator narrates at the middle of the film explaining how they have found nothing. It is also hard to tell if they are going through the jungle or rainforest part of The Mysterious Beyond. They find a dead duck bill. Grandpa says it was traveling from the opposite direction, thus it has no food. Mr. Threehorn says it walked in circles. Surprisingly many agree with Mr. Threehorn. In 11 I understand that, but this is just two movies after 3. He insults duck bills making them mad. Littlefoot and Cera then fight. For a while I thought this was a bad scene, until I realized it is all justified from their exhaustion and hunger. The herds decide to split up, but at night the main characters leave. Their plan is to get the grown-ups to stay together by following them. The grown ups owe them a life debt from 3, making this a very good plan. They eventually find a huge ocean, and humorously spit it out. 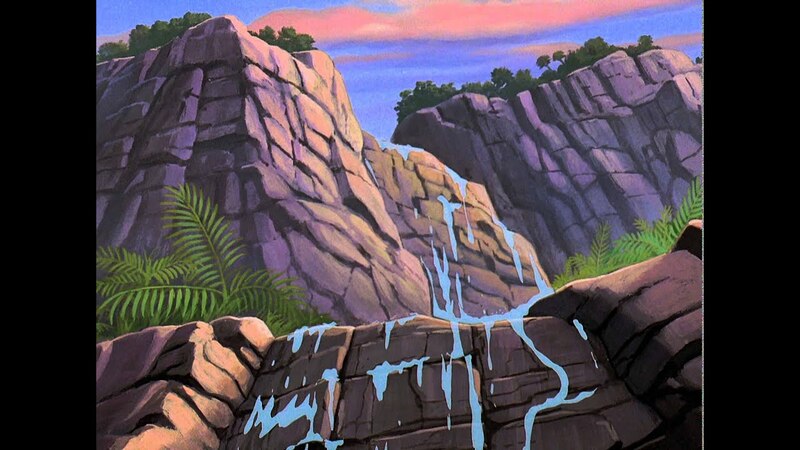 Even Littlefoot then wants to give up until Spike finds a green island, and Petrie points out a convenient land bridge. Apparently it is guarded by the tsunami goddess, which attacks them with Spike at the back. It is a very good action scene. They are happy to be with food until they realize the land bridge was destroyed. The grownups followed their footprints and assume they are down the ocean. I have been told it is the most realistically drawn animal in the series. The swimming sharptooth is very scary, and this is a great action scene. Petrie’s reactions are the best. Also a piranha tries to eat Ducky to foreshadow it earlier. They finally get back to the island just to hear a walking sharptooth on the island. Grandpa is giving up hope on finding Littlefoot. On the island something keeps resembling a sharptooth including a rock perfectly shaped like on (a dark call back to the original). 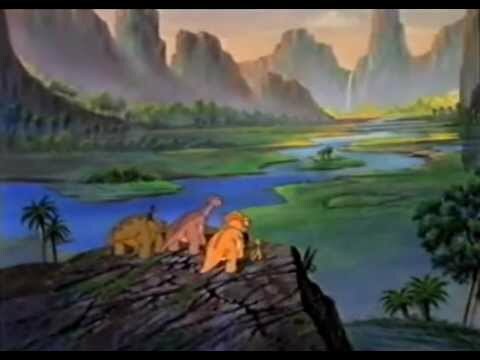 They sing “Always There.” I really love this song, as it has very good sad parts from all the four singers including Littlefoot singing about his mother. The next night they are scared by a shadowy sharptooth. Nothing is scarier, so they keep it hidden, which is a nice different touch. It is actually Chomper from 2. This is great. Until we are reminded about sharpteeth. How does he speak leaf eater? He was raised by them, so of course he is bilingual. He is sure his parents will love them as friends, but the main characters disagree and hide like squirrels from a dog. Littlefoot thinks they are intelligent, which Cera doubts. Littlefoot is shown to be right, and they interpret Chomper as joking and say his friends would be good dessert. They also get excited when they smell Longneck until Chomper stops them from tracking them down by claiming it is his breath from eating longneck earlier. After they leave a Giganotosaurus shows up. He sniffs out their old hiding spot and eats it. Frank Welker is wonderful in this film. His earlier conversation had so many emotions all portrayed through roars, and his portrayal of giganotosaurus is far more vicious than ma or pa sharptooth. In a side plot Ducky nearly dies by leaving the group, which further shows how besides Littlefoot they distrust Chomper. I like how they gave Chomper pectoral muscles to help us think he could kill them, but I do not like how he has three fingers instead of two like his parents. His hiding spot is full of stinky flowers to keep them safe. He gets them food during the song “Friends for Dinner.” It is the least good song in the film, but still good. He gathers “anything he wouldn’t eat.” His parents see him and “…worry about that boy.” Littlefoot still defends him, while the others half joke about him eating them. It helps show that they are from two completely different worlds that naturally do not go together well. Basically a friendship that cannot stay close, but Littlefoot and Chomper are determined to make it last. They love Chomper’s food, but Cera accuses Littlefoot of offering his foot to Chomper. I guess the journey through the mist left Cera paranoid. Chomper leaves crying, and the others agree he will turn on them eventually. Littlefoot rushes to apologize. After Ma sharptooth gives some surprising and needed comic relief Chomper and Littlefoot agree that they are very different, but can still be friends. Chomper knows they took care of him at a young age and wants to return the favor, but Littlefoot knows they have to leave at some point, and he gives Chomper the point while staying very nice and appreciative. Sure the blood vanishes later, but this is great. With a T-Rex’s jaw biting it there I think Giganotosaurus has a broken chest. He fights Ma despite his busted pectorals and more blood. She is now nearly down, but Papa hits him in the head with his tail and sends him over the edge, but he knocks Chomper in. Mama gets up and howls in fear and later anger. 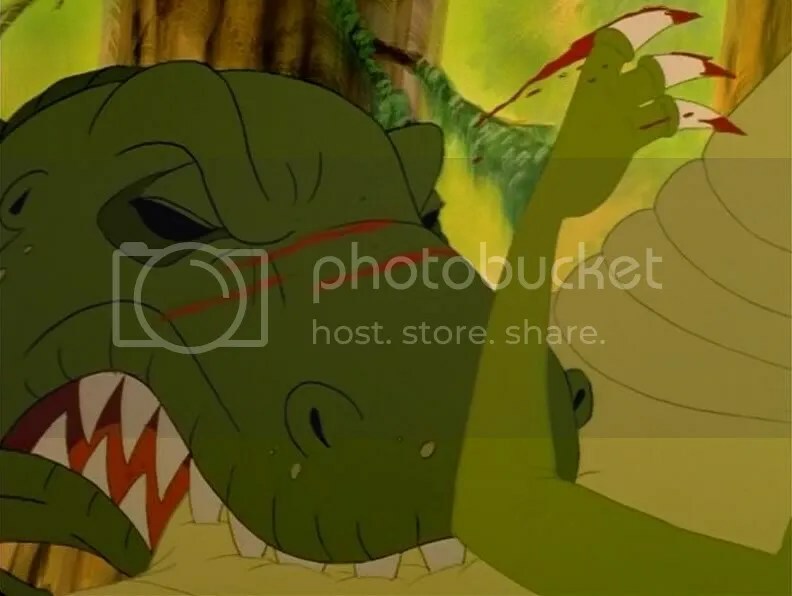 Littlefoot realizes that if Chomper is not saved not only does he lose a friend but the sharpteeth will kill them all, for he jumps in after Chomper with Giganotosaurus still trying to eat them until he floats away with all of his broken bones and knowing he is crippled for life. It looks good then. Then the swimming sharptooth shows back up, only to be a friendly swimmer (not the shark from earlier) who gets them up, and can get them home. Chomper still wants them to stay, and his parents promise to keep them safe, but it is obvious even they have doubts about being able to keep the promise. In a bitter-sweet ending (partly ruined by the TV series and 14) they leave and make a very sweet reunion with their families, as the instrumentals to “Always There” play. I know “If We Hold On Together” was played at least once, but it was never notable. I still love this film. As an adult not as much as 7, but as the target audience way more. The Theme Era is the new top era. This film has great scenes, lovable guest characters, an intimidating villain and intimidating sub-villains and heroes. Besides Petrie everyone got a role. The lesson is that despite friendships having to end due to circumstances the friends will always be true friends to each other by doing what is best for the other. This film also gives a superior closure to Chomper than 2 does. The best songs are now 1. Very Important Creature (7) 2. Beyond the Mysterious Beyond (7) 3. Bestest friends (10) 4. Always There (5) 5. Big Water (5) 6. The Lesson (8) 7. Family (8) 8. Adventuring (10). 9. flip, Flap, Fly (12). 10. How do You Know (13). 11. On You’re Own (6) 12. Chanson D’ Ennui (9). The new film rankings are 5, 7, 6, 10, 8, 14, 12, 11, 9, 13. It was close for the top spot.